When you opt for a software for the development of e-commerce, the options to choose from can seem to be quite tempting. Magento is among the best e-commerce platforms available till date. This technology helps in content management and is based on PHP and MySQL. In addition to that, it consists of important modules which can be installed easily to customize a great virtual store which helps in meeting your business requirements. Besides, visitors can make easy payments with the help of multiple payment options. It consists of drag and drop tools with which can be customized by retailers to save admin views, customers feedback as well as other information. Want to create a customized website with a wide range of content management tools? Do not panic, contact our experts at Tech Support Dubai for Magento web development services. With the changing tastes and preference of the customers, the market conditions are becoming agile. Hence, it is important for you to enhance your marketing skills with convenient delivery services. 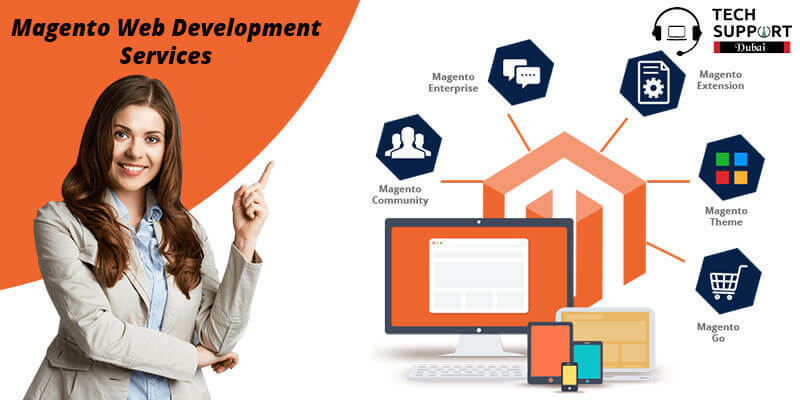 To execute these, you need Magento development which helps to provide customers with quick browsing facilities which makes purchase decision easier. The most interesting fact about Magento is that it is mobile friendly and highly responsive, which in turn helps in making the sites visible on tablets and other mobile devices. Thus, customers can connect with their brands anytime and from anywhere. Magento has a page editor which makes it easy for the online store owners to make changes in their offerings. In order to use this tool, knowing about programming codes is not necessary. Instead, it provides user-friendly features. It helps in search engine optimization. The Magento website owner will not face any kind of organic traffic flow. Want to know more about Magento? Are you searching for Magento Web Development Company in Dubai? Feel free to talk to one of our executives by dialling our helpline number [ ]. Our team consists of professionals who can easily design and develop the desirable Magento online stores for you. We use the most creative ways for your stores. Our services are designed as per your interests and we make sure that it is attractive as well as navigable. Our members specialize in theme and template development, store development, e-commerce website development, etc. Change your business dreams into reality with our assured services. All you need to do is connect with our professionals and share your requirements. We do the needful in providing you with premium services for Magento web development in Dubai.